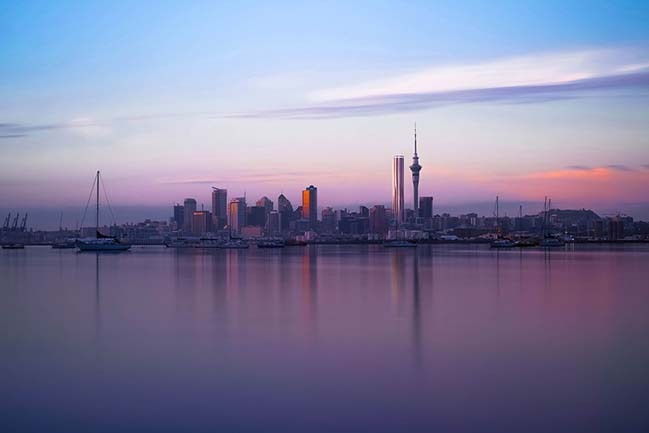 The challenge is to design an urban icon that balances Auckland’s rich and unique heritage with its identity as a growing, vibrant and future-ready city. From the architect: So our response to the Federal Street site is a personal and complex one. In contemporary architecture, landscape is often reduced to view lines and decoration. But we have sought to evacuate the ground plane and to reinstate the traditional forests of the New Zealand Taraire. 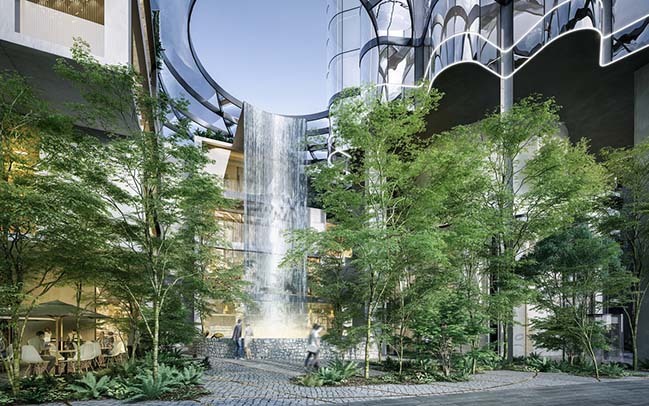 We see this as a gift to the city, a visceral tactile forest experience with waterfalls and rocks and moss and layered dense vegetation – a real, living forest experience for residents and visitors and public alike. At the heart of the forest is a well, where the rushing water cascades from above and crashes into an underground grotto below. A new people place, to revitalise Federal Street immediately and the precinct at large. 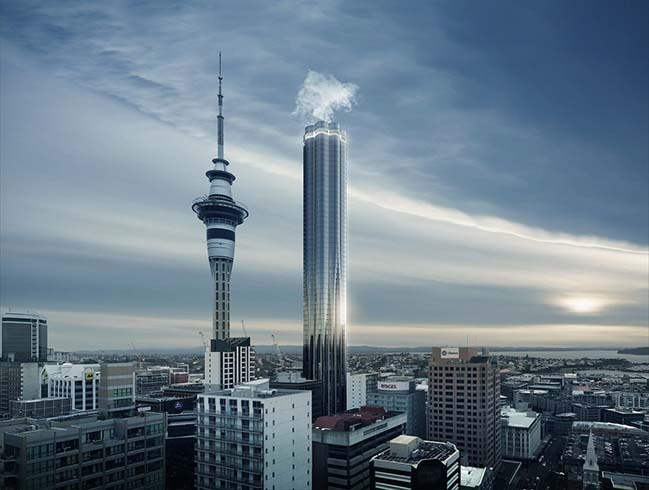 We have proposed a tower that reflects Auckland’s dramatic location atop 48 volcanoes. 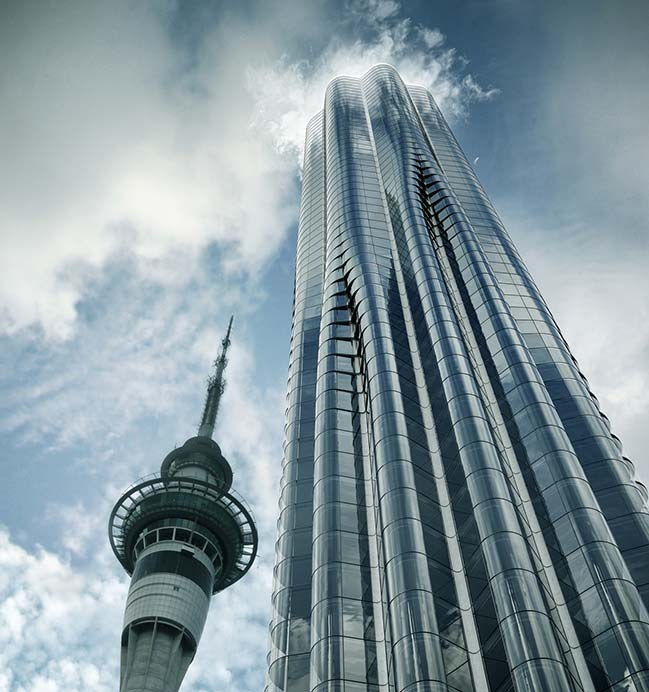 It starts almost 25 metres above the ground and rises through hotel and apartments to almost 210 metres. 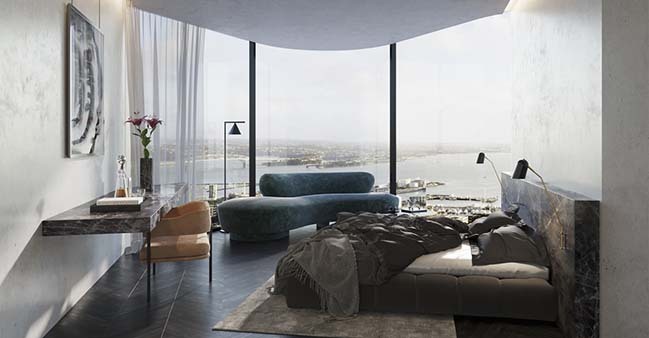 The architecture is driven by the desire for each room to have a huge curved glass bay window so that occupants can sit directly into the view lines of the urban geography. 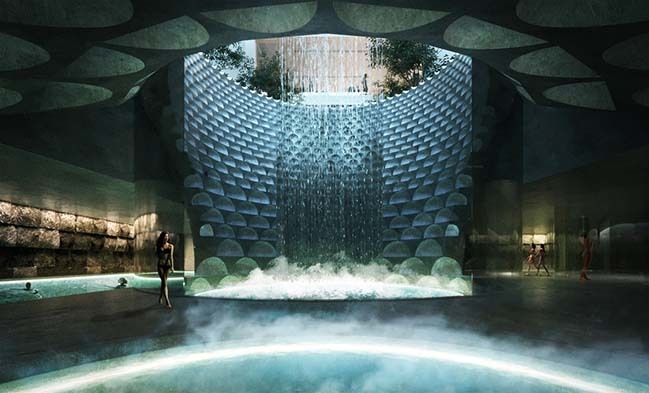 Tighter bubbles for the hotel rooms transition into broader bays for the apartments as the deep pewter coloured glass pours like a liquid volcanic surface. At the top of the building sits a destination restaurant dedicated to the provenance of its materials. 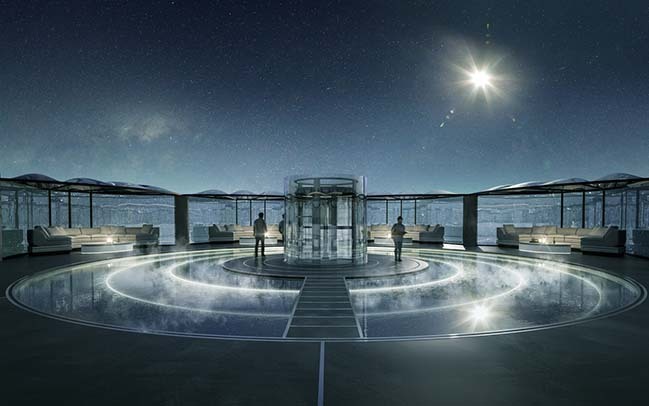 A cylindrical telescopic lift rises from this floor to the rooftop which holds a spiral format heated ozone pool, steaming in the cool evening air. Poolside lounges allow visitors and residents to sit within the stars of the night sky and intimately consider the cosmos and our collective future. The apartments at 65-71 Federal Street are a dramatic break from the past. 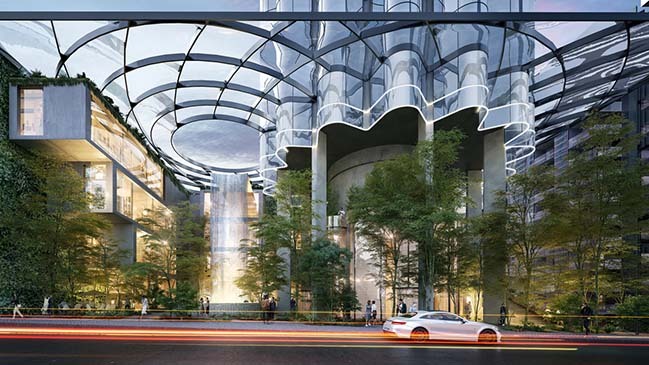 A personalised direct lifting service takes residents directly into the their homes without entry corridors or strangers or keys, making every apartment a penthouse with its own lift. 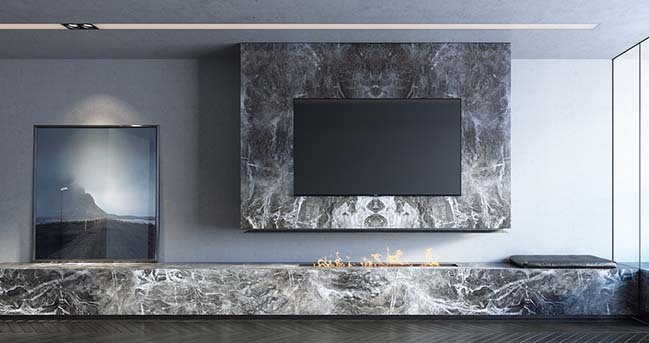 The apartments are best in show in all aspects of material supply, a direct to manufacturer approach which ensures the highest quality components in an integrated technology rich environment that we call The New Standard. We have been working on it for almost three years and are finally releasing it here. This is the building that we have been learning for our whole lives to achieve, a moment in time that changes everything that will come after it. 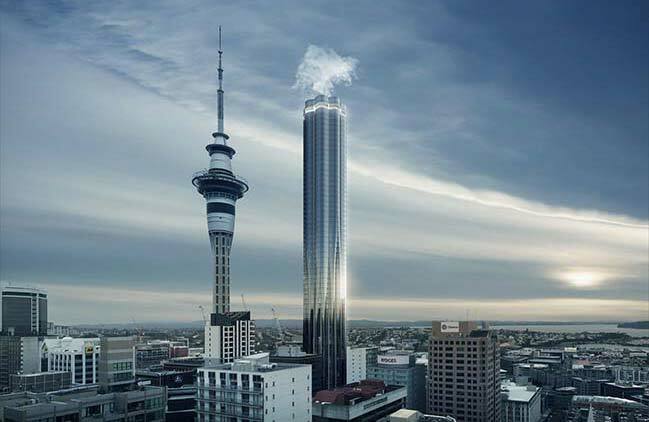 The kind of building that Auckland deserves.